"Jack is our 11 year old British Shorthair who became disorientated and found himself lost after we moved house in April. 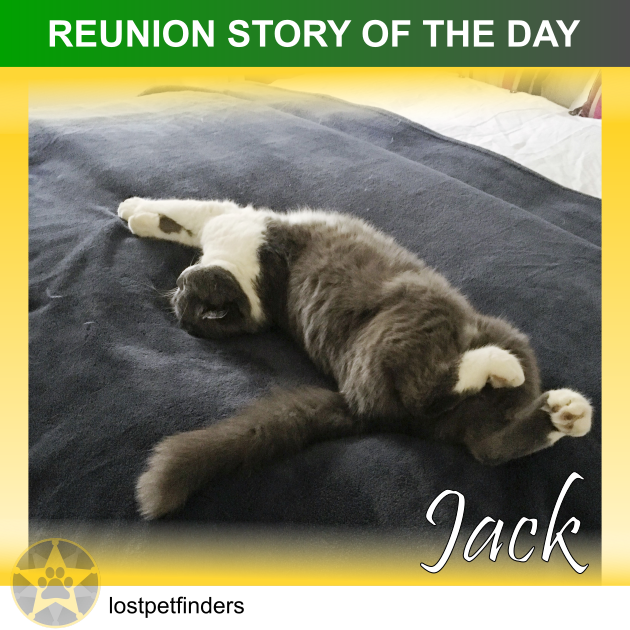 He is a gorgeous boy who loves routine and never strays far but moving from Prebbleton where we lived in a large house with a large garden, to a two bedroom townhouse in Somerfield was a bit daunting and confusing for Jack. The move also coincided with the start of the school holidays and I was worried that he might be in someone’s garage and that the family may have gone away for a couple of weeks. Another factor which would not have helped was that we put Jack in a cattery for five days while we unpacked as we didn’t yet have a cat door. Unfortunately on the first day home from the cattery he did go outside – and he didn’t return. Because he is such a homebody who doesn’t take easily to strangers and is scared of children, I realised he wouldn’t make himself known to people and therefore we were worried about him surviving for too long on his own - being older and also being used to the comforts of home. We also figured he would probably be easier to find at night. What did we do to try to get him back ? We printed a few hundred flyers which we dropped into letterboxes in the area. We placed an advert on Trade Me, we joined Lost Pet Finders, rang all the vets in the local area, contacted the SPCA and Cats’ Protection League (mainly for advice on what to do). We were given valuable information on how to entice Jack home – like leaving an article of our clothing outside or his favourite rug that he likes to sleep on, or (if you have any) some of his kitty litter that he may pick up a whiff of. It was also suggested that we look for him late at night or during the early hours of the morning when he would have more confidence to be out and about rather than hiding in bushes. The good news! We were driving home from the Court Theatre 6 nights into his disappearance, when my husband saw him run across the road. He was only one block away from home! When he heard me calling him he stopped on the footpath and waited for me to pick him up. Relieved and overjoyed (all three of us – I think I can also speak for Jack) we took him the short distance home in the car. He was hungry but apart from that he was in good shape. One lesson we have learnt is that we did not spread the net far enough when we were walking around streets calling his name. He was very close to home but unfortunately we were looking in the wrong direction as we ASSUMED that he would have gone in that direction (which he didn’t – he went the other way). After we found him we kept him in for two weeks. Now he has a brand new cat door and once again he is back into a routine and doesn’t stray far. He’s an older boy who likes to structure his day mainly around sleeping – on his rug on our bed during the day and on his rug in our living room at night. Now that we have been in our new house for six weeks he is confident in his surroundings and is never too far away to hear me calling him. I would like to say a huge thank you to everyone who cared about Jack when he was missing – and that includes Lost Pet Finders who provided amazing support both practically and emotionally, to help us find our much loved boy. I have realised how many kind people there are in our city and in my opinion pet lovers are amongst the nicest people around.